← Questions from Jurors are GOOD, Period. All expert witnesses are gonna get one of these labels. Don’t you want the first one? You’re an expert witness who wants to add the greatest possible value to your side. 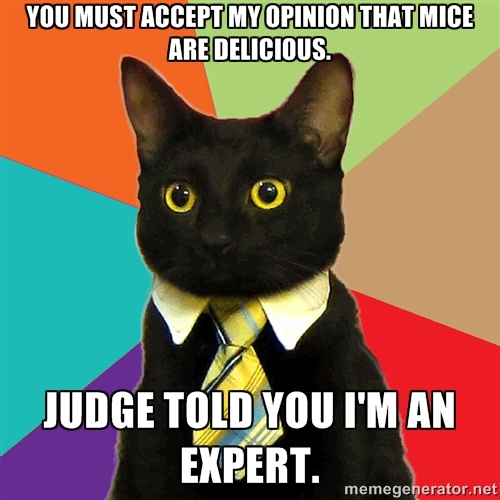 (Or you might be the attorney who wants to get the most juror persuasion out of your expert.) You’re in the right place. You can choose which label the jurors will put on you. You might not know me very well, but trust me, you should not want the second or third one. You’re welcome. There is so much more to know about how expert witnesses can influence jurors than the usual “ten tips for experts” usually offer. Yes, it’s important to listen to the question; yes, it’s important not to guess; yes, it’s important to give answers that don’t begin with “yes, but…”/”no, but…”. And if you’re the attorney, there’s more preparation you should be doing than just telling your hired expert witnesses to wear a suit and bring some pictures. What Role Does Expert Testimony Play in Juror Decisionmaking? As I point out a lot, if juries could post their relationship status with expert witnesses, it would be: It’s Complicated. Let’s look at what the social science research tells us. First, jurors do not automatically like or trust expert witnesses, nor are they impressed by credentials. For one thing, most people don’t necessarily believe they need an expert to resolve the issues. We live in the age of WebMD, for heaven’s sake—people won’t always defer to true expertise for their own health. Everyone thinks they can fact-match complicated phenomena by themselves, given their own intelligence and life experience. Valid or not, their confidence in their conclusions is high. So you are not the shaman they seek. For another thing, the research shows that jurors believe that the lawyer who hired you probably did a hard-target search of listservs, bar associations, LinkedIn groups, and other lawyers in their tribe in order to find you because you’ll say exactly what their side wants you to say. They know very well that your testimony is a choice—yours as well as the party who is paying you. Jurors also believe – as do we all – that there is disagreement within professions. And right on cue as if to reinforce that exact belief, the other side announces to the jurors that they will also be putting on an expert witness who has opposite opinions. So your word is neither the only nor the final word on your topic. Further, it is true that expert witnesses neutralize each other to some degree . . . with one enormously important exception to be discussed later. Besides being distrusted, greeted with skepticism, minimized by false equivalence, and possibly not much more than a neutralizer—cheer up! In fact, it’s not so bleak as all that. There is real value to be added by good expert witnesses. Similar research shows, though, that your confidence should be moderate. Too much confidence feels like arrogance, which is off-putting to jurors. Too little confidence yields a manner that will feel nervous and deceptive to the jurors. You have to Baby Bear it—not too much nor too little, just right. Your testimony must be as concrete and relatable as possible. Abundant research shows that expert witnesses have more impact when they present concrete examples and anecdotes than merely summarizing their findings from research or analysis. (‘American Juries: The Verdict,’ by Neil Vidmar & Valerie Hans, 2007, p.180, and literal tons of other studies.) One part per million does not have much impact; relating it as 30 seconds out of one year does, though. Expert testimony when done well creates powerful impressions. And the mental stance you adopt and keep telling yourself on the drive to the courthouse, waiting in the hall, walking up to the witness stand – is that your job is to teach, and to keep that patient attitude when the opposing attorney cross-examines you. Never let the opposing side’s tactics and attitude make you see him or her as a bully, as that will trigger a cascade of emotional reactions inside you which will leak out and lessen your value. Rather, relentlessly see the opposing lawyer as a struggling student who does not understand your subject, and needs your patience and guidance. It’s a whole different air. Similarly, realize that the “challenges posed by the opposing attorney are simply invitations, which do not have to be accepted.” (Waites, pp.460-61, emphasis added.) And should not be accepted. Stick with seeing that person as the student who is just not catching on. You cannot control the other attorney, only your answers. Relax into that truth and you’ll be a better witness. I discuss this consciousness at some length because it is more common than not that expert witnesses are friendly and warm when their side is asking the questions, then chilly and stiff to the opposing attorney. That’s a credibility killer. Totally natural and understandable, yet jurors nevertheless read into that various unhelpful things, like a lack of objectivity, or nervousness, or lack of confidence. Your tone and body language must be the same for both attorneys questioning you. And it all starts with the right frame of mind. Remember that exception to expert witnesses neutralizing each other? It is this: When one is a better teacher than the other. And that is what you must commit yourself to become. Because the better teacher wins. Notice that the key is not being the Nobel laureate in one’s field or the dean of the Harvard department of whatever your field is. Let’s agree that you are intelligent, knowledgeable in your field, and have much to offer a group of laypeople in understanding a topic really well. But to adapt a cautionary metaphor from the 1980’s and 90’s, a trial team that hires an expert witness is not just in bed with that witness, but is now in bed with every lawyer who ever prepared that witness before. Attorneys and others might have taught you bad habits, or failed to teach good habits, or were not themselves skilled enough to teach you. In short, just because you are smart and testified several dozen times does not by itself make someone a good witness. There is no correlation between how many times you have testified and how good of an expert witness you are. In reality, practice does not make perfect; it merely makes permanence. There is no getting around that a lot of practice of both direct and cross-examination with a good coach is the only way to make sure your testimony will give maximum value. Your confidence is a huge ingredient to juror perception of credibility. Unfortunately, in the days and weeks before trial, trial counsel has several dozen important things to do, and usually does not prioritize either the time or the fees involved in spending hours with you doing a mock cross. In truth, they often also rely on the belief that you’re a pro, you have experience, and – most dangerous of all – that your actual expertise somehow correlates to your talent and value as a witness. Push your attorney for some practice time, and if not, then some time with their trial consultant. Especially the trial consultant. I don’t say that out of mere self-interest, but rather the long-observed phenomenon that while lawyers are the legal experts and great at legal analysis, trial consultants are better at understanding what gets through to laypeople and how to get there. If your attorney client is worried about the costs of preparing you, then waive your fees for a few hours of prep if you can afford to. The preparation will be well worth it for you—especially as word gets around that you are a high quality witness. Well . . . those things don’t hurt. But not only are those not sufficient conditions for persuading jurors and adding value for the lawyer who hired you, they are not even necessary ones. The best experts are willing to listen to the trial team, including the lawyer and the trial consultant, and learn the case they are putting on before going on auto-pilot and just testifying how they testify. The best experts realize that they are supporting actors, and that they must adopt the agenda of the trial team, not their own. Narcissists don’t make good expert witnesses. First tip: Go to court and watch another expert witness testify. Ask yourself what makes this person more believable or less believable, more likeable or less. I’m not suggesting that you copy their technique, as he or she might not be worth copying. The exercise is about noticing the components of credibility, which are likeability and competence as a witness. It’s not mysterious. It’s those two things. Raise them to a conscious level and you’ll surely be a more valuable expert witness. Answering Questions. Some of the old advice becomes the old advice because it is timeless and true: Tell the truth; don’t guess; saying “I don’t know” is perfectly fine, especially if it is the truth; avoid jargon and industry lingo, and know how to explain all of that; never argue with the opposing attorney. Give narrative answers, descriptive and longer. Laypeople describe such witnesses as more dynamic and competent than those who speak in a more fragmented style. Avoid qualifiers such as “I guess” or “I think,” as they are powerless speech. So is excessive politeness. I advise witnesses to be constantly polite, but within ordinary boundaries. While “I don’t know” is always acceptable, a better answer in certain circumstances is, “Those assumptions were not part of this analysis, and I can explain why.” Opposing counsel has only two choices: let you continue or not. Either way, your side gains value. For cheesy yes/no questions that are a favorite format of cross-examiners everywhere, an answer that you can give politely is, “[Pause] That cannot be answered with a simple yes or no, and I would like to explain why.” Same two choices for the attorney: let you or don’t. Either way, good. Do not end your sentences in a rising tone. Because rising tones? Make it sound like you’re asking questions? And undermine your authority and credibility? Mind your body language. Start with good posture, relaxed and upright, leaning slightly forward when you’re talking. Get comfortable, as you want to avoid shifting posture too often. Use “illustrator” gestures, such as nodding or shaking one’s head, pointing, small and non-distracting pantomimes of what you’re describing. Keep eye contact with your questioner when he or she is talking, and make occasional eye contact with jurors when giving your answers. Don’t stare at them. Just every so often make eye contact with them. Never look at your side’s attorney after the opposing attorney asks you a question. Stop for a second and picture how that would look. Awful. A lot of these lists of advice include “Pause before answering to give the attorney for your side a chance to object.” A brief pause is a good idea, but not for objections. It is good to give your brain the chance to make sure it heard the question correctly and can form a great answer. But ideally, the attorney with whom you’re working will not object, even to questions that are technically objectionable. Jurors dislike objections, and penalize the objector. It is rarely worth that price. So one way that you can add tremendous value is handling tricky questions well by yourself without having to be rescued with an objection. The answers to tricky questions provided above will help you out of almost every objectionable jam. Your job is to create powerful impressions. And neither of those happen without good quality preparation. Got any great stories about seeing or being an expert witness? Any other thoughts on this topic? Any cool research? Share your thoughts here. This entry was posted in Depositions, Expert witness, Jury Persuasion, Jury Research, Trial, Writings and tagged civil lawsuit, consultant, expert, jury, Lawyer, persuasion, trial, trial consultant, witness preparation. Bookmark the permalink. Excellent article. One of the best experts I have had was great on cross because as cross began he would move forward in his chair and rest his arms on the box – the impression he gave to the opposing counsel, and the jury, was that “I’m just hear to help you”, which came across very effectively. Thank you, Kevin. That is a nice move. “In reality, practice does not make perfect; it merely makes permanence. Had to read this seemingly contradictory juxtaposition twice. I actually agree with it though–repetition alone is not sufficient. Practice with proper guidance (from whatever source) can be enormously helpful. Same goes with trial attorneys, BTW. Thanks for your comment, Drew. Much appreciated. Excellent advice. Thank you for sharing your insights!